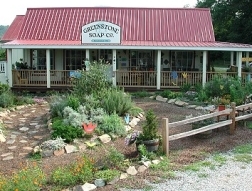 Greenstone Soap Company was established in 1996 by Kate and Bruce Rodgers, with a very simple philosophy of life and work … “have faith, do what you love, don’t make a bigger mess then you can clean up, use tools rather than machines, and laugh often.” We still live by these ideals. We started Greenstone as a part time business but shortly made a decision to expand the company into a full-time business. We also decided to move out of the city and relocate in the north Georgia Mountains. In the early fall of 1996 we quit our full-time professional careers, packed up, and headed out of town to pursue the ancient arts of small business and herbal soap making. In our second year, we made what to many of our friends and family seemed like a foolish, crazy decision. 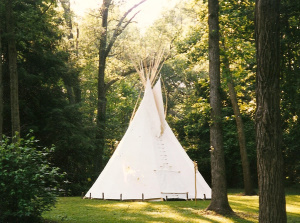 We bought a Tipi and went looking for a place to set it up. 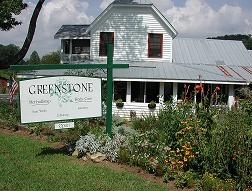 We also needed a building where we could make our all natural handmade herbal soaps and other body care products. In the spring of 1997, we found what we were looking for. 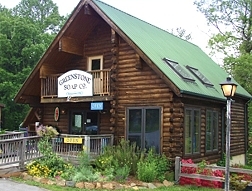 For a time, our home and corporate headquarters for Greenstone Soap Company, was a Tipi set in a beautiful grove of young Pin Oaks, overlooking a grassy field on the property of a friend (we made soap in a small garage also on the property). This is certainly not the path to growth for most companies, but to this day we look back on that experience as one of the most profitable and creative times in the life of Greenstone Soap Company; with no television, no newspapers, and almost nothing to dust (hence no distractions), all our energy and creativity was freely focused on the business at hand – and if the truth be told, it was sheer fun … and, go figure, the business continued to grow. In 1999 we moved out of the tipi and located in an old farm house. With hard work and plenty of enthusiasm we soon established a small road side attraction; With a retail store, an assortment of herb and flower gardens, an art studio and on-site handmade soap-making, people came from all around to walk the gardens, shop in the store and visit the goats that belonged to our neighbor. It was pure fun! 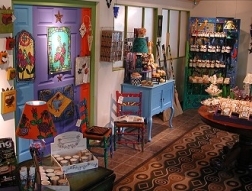 … as we continued to attract even more people to the gardens, the shop and the art studio of our now expanded roadside attraction. 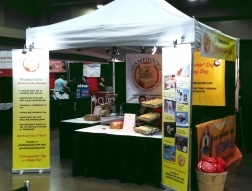 And in 2006 we downsized into a new location, still in Sautee, and continued doing what we loved; making all natural products, and meeting people from all over the country. Then, in 2014, we made a decision to close our brick-and-mortar store and took the business fully on-line. Making this decision was tough, but we wanted the freedom of not being tied down so we could spend time traveling around the country promoting what has become our # 1 selling product; Shampoochie® Dog Shampoo bar (shampoo without the bottle)! Online: Secure Credit Card ordering. This site uses Secure Socket Layer (SSL) encryption, so your transactions are safe. Within the continental US: We ship either US Priority Mail or UPS within 24 hours of receiving your order. 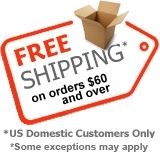 Orders over $60.00 are free within the continental US. International Orders: Shipping and handling charges to your location will be computed at the time of shipment. You may be subject to import duties and taxes, which are levied once a shipment reaches your country. Additional charges for customs clearance must be borne by you; we have no control over these charges and cannot predict what they may be. Customs policies vary widely from country to country; you should contact your local customs office for further information. Additionally, when ordering from us, you are considered the importer of record and must comply with all laws and regulations of the country in which you are receiving the goods. Customs policies vary widely from country to country; you should contact your local customs office for further information. Additionally, when ordering from us, you are considered the importer of record and must comply with all laws and regulations of the country in which you are receiving the goods. Shipping charges are set as close as possible to the actual cost incurred, excluding duty and taxes.